This 380 ACP is ideal for short-range target practice. 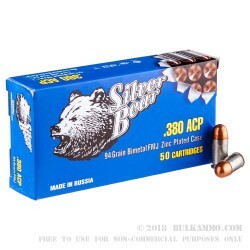 Silver Bear uses Berdan-primed zinc-plated steel casings that significantly reduce the cost of this non-reloadable practice ammunition. 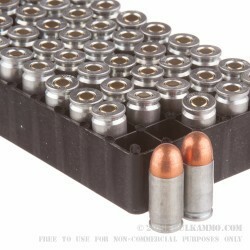 This 50-round box of 380 ACP cartridges features 94gr full metal jacket (FMJ) projectiles with bi-metal jackets. 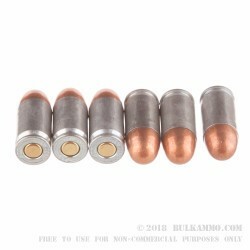 The bi-metal FMJ will attract a magnet, so always check with your shooting range before packing a range bag full of this .380 ACP ammo. The zinc-plated steel casings are treated to resist corrosion and feed smoothly in the chamber. 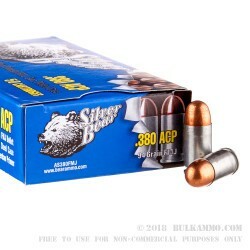 Many shooters are weary of Russian-made ammo, but Silver Bear has perfected steel-cased ammo for American shooters with high standards. This ammo is reliable and will not damage your firearm. High-volume shooters will love the added value of this steel-cased .380 ACP. Order your 50-round box today so you can get to the range ASAP!